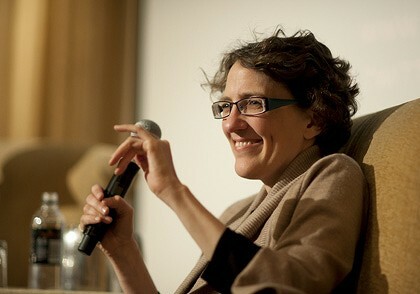 I heard Jane Espenson speak at a university in Los Angeles and was struck by her philisophical views toward television writing. She has been writing for TV since Buffy the Vampire Slayer and has carved out a stellar career as a writer on the sci-fi/fantasy/supernatural genre show. Once Upon a Time, Game of Thrones, Angel, Firefly, and Star Trek: Deep Space Nine are just a few of the series she has written for - and judging by the crowd in the room, she has established quite a fan base for herself. In a world in which most people don't really think about the fact that shows have scripts, Jane has accomplished the impossible for a television writer: she has established name recognition. One of the downfalls to name recognition, however, is that fans tweet, blog, Facebook message, and otherwise offer Jane suggestions for show direction. Contrary to media experiments in which producers allow fans to control characters and plot, Jane feels that we must respect the "artist's palate." She compares her work to that of a chef, explaining that she considers herself the audience she is writing for. Jane writes in her blog, "Not only am I saying I ignore all those fans who are desperately telling me what they want, but I'm also saying I'm writing for one very specific person who may not be at all representative of who is actually watching...here's how I defend it. I think there's an analogy to be drawn with cooking. Theoretically, why does a chef need to have a good palate? If the chef is cooking what the diners like, why does the chef have to like it? Why, in fact, does she even need to know what it tastes like? Well, obviously, I'd rather take my chances with a chef who likes the food they're cooking than one who doesn't. Only the chef who likes it is going to know when it's exactly right, not almost right. And only the chef who likes it can put passion into it, playing with the flavors night after night, augmenting and complementing and pairing the dish with wines and so forth." Jane feels she is an aficionado of her show, and we should respect her taste in terms of character development and plot direction, rather than demanding that she kowtow to fan suggestions - which may be misguided, uneducated, or just plain crazy. Another interesting aspect of what I will call "Jane's Philosophy of Television Writing" deals with the topic of message. In a town in which one of the most bandied about quotes comes from movie mogul Samuel Goldwyn and goes something like "if you want to send a message, call Western Union," it's refreshing that Espenson actually believes in theme and underlying meaning - a.k.a. a message. Have something to say - she encouraged the emerging writers in the room. Story is always more impactful if it has a point of view. "One thing that makes a show brilliant," she argues on her blog, "is if it's got a macro reason to exist - if it's got a point to make. You might find it helpful to think of your [show] as having a topic sentence, just like an essay. Here are some topic sentences that could fuel series: Sometimes crime can be justified in an unjust world. Intelligence is a social deficit that can be overcome by applying intelligence. Childlike beliefs keep us young, for good and bad. Justice needs the help of dedicated people in order to prevail. Outsiders can form a family that's stronger than one connected by blood. Strong leaders pay an almost unbearable price. Competence can outweigh compassion. Immoral but necessary actions ultimately corrupt anyway." Espenson feels "it's good if it's something you really believe." Both of these philisophical points embrace the sense of a writer's core. Writers need not crumble in the face of external pressures - they should write what they believe and what their "artist's palate" tells them is good. Even when faced with notes from executives and others in the writer's chain of command. "Keep it in mind when you're getting notes on your completed draft," Jane argues. "If taking the note is turning your script into something you don't enjoy reading/watching, then think about the reason behind the note and see if you can find another way to address the problem that doesn't make you have to cook and eat literary Brussels sprouts."